For the last few months now, Netflix regularly published a list of the fastest ISPs for streaming video. 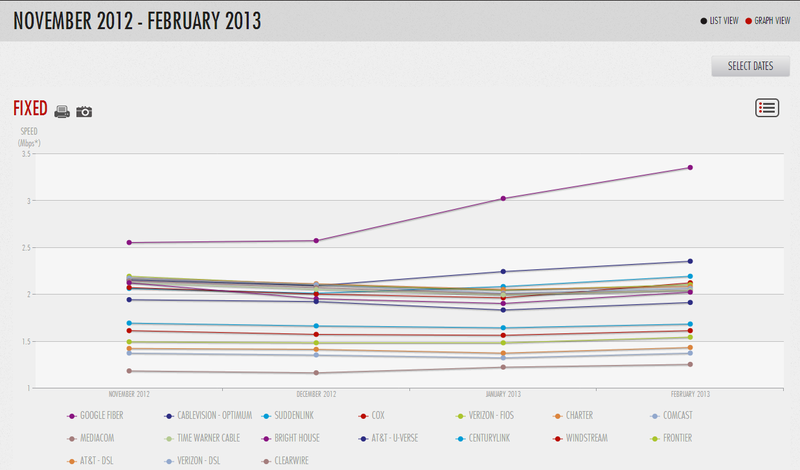 Today, the company launched a dedicated site for this data, the Netflix ISP Speed Index. The Speed Index includes data from many of the countries the service is currently available in, including the U.S., Mexico, Ireland, U.K.,Norway, Sweden, Denmark and Finland. Unsurprisingly, Google Fiber, with an average speed of 3.35Mbps, offer the highest average bitrate for Netflix streaming, followed by Sweden’s Ownite (2.99Mbps). The data on the site, Netflix says, is based on data from more than 33 million Netflix members ” who view over 1 billion hours of TV shows and movies streaming from Netflix per month.” The historical data on the site goes back to last November (and according to these stats, Google Fiber has only gotten faster since then) and the index will be updated on a monthly basis. While this index is clearly meant to highlight the best ISPs for streaming and shame those who don’t provide a lot of bandwidth to its users, Netflix is also closely working with a number of ISPs to improve its users’ streaming experience. Its Open Connect content delivery network, for example, lets ISP peer directly with Netflix to save transit costs. Netflix also offers a storage appliance to ISPs. This server, which sits in the ISPs data center, effectively works as a local cache for popular Netflix content. Thanks to this, Netflix can now offer higher a higher bitrate for its 1080p HD streams and 3D titles to users whose ISPs have installed these appliances (which includes many of the higher-rated ISP in its Index, too).